How Tight Should Bearings Fit? Here is an interesting video showing how bearings are made. It appears to be an NTN factory in Canada. Shielded/non-contact bearings have a metal plate covering the balls, cage, and races. Sealed/contact bearings have a (usually black) neoprene cover instead. Open bearings, as the name suggests, have no shields or seals and are open on the sides. The big difference between a shield and a seal is the seal is a contact seal. The seals have a lip running on the inner ring of the bearing. The shield is a gap seal. It does not touch the inner ring. Sealed bearings have much more friction compared to shielded bearings, and thus are generally rated for lower speeds than shielded bearings. If you hold a shielded and sealed bearing in your hand and spin each, then you will clearly feel the difference in friction. A shielded bearing will almost spin free and a sealed bearing will not spin free. A shielded bearing will run cooler at higher speeds, but it does not have the same dirt exclusion abilities of a sealed bearing. This creates the possibility of fine dust working into shielded bearings through the shields. Open bearings are nice because you can always clean/repack with grease 10 or 20 years from now (assuming you and your machine are still alive and well), but are not suitable for locations where dirt/debris can get into the bearing. If the bearings are lubricated by an oil system, then open bearings must be used. Ceramic bearings have the normal steel balls replaced by white ceramic balls. The ceramic balls are made of solid silicon nitride. Ceramic silicon nitride balls are called ceramic but have nothing in common with household dish ceramics. They are called ceramic because it's easier calling them ceramic then silicon nitride. The ceramic silicon nitride ball is by far, smoother, harder, lighter and stronger than one made off steel. Bearing Kinetics is one supplier. Sealed for life bearings work better in applications where you don’t have the fine dust you see in woodworking. This super fine dust functions like silica gel for bearing volatiles and can greatly shorten the life of your bearings by drying up the lube. For example, Oliver 299 type one planers use grease zerks for lubricating the bearings. In this case, it’s unreasonable to have oilers in all those bearings with the bed rollers, section infeed rollers, outfeed rollers etc. On type two machines, Oliver switched to sealed for life bearings. They are expensive and require much more rebuild effort than a zerk greaser or a full bath oiler. Jointers are also a natural for this type of bearing and it works great. Run-of-the-mill sealed bearing have contacting seals which generate heat due to friction. Some manufacturers such as Koyo make a non-contacting seal that will allow higher speed operation without as much heat buildup. The problem gets worth considering when you are running in the 10-20,000 rpm range which for most of us means shapers. In these higher speed ranges, the cage material becomes critical. Regular old motor bearings have steel cages. Higher speed bearings have brass/bronze or plastic cages. What the bearing folks are trying to do is to minimize cage weight. The idea is that less weight flying around in the bearing requires less energy to make it fly around , thus producing less heat. To make a bearing functioning properly when running fast you need to keep it lubed and to keep it cool. Too low of a lube viscosity means the lube gets thrown out, and your balls aren't slick anymore. Raise the viscosity of the lube and it stays where it is supposed to be, but now you generate more heat . An interesting question is: when is a speed considered to be "high speed" for a certain bearing size, and thus when do you need to consider special cage designs? For that there is a speed factor called ndm that can be calculated. Take the mean diameter of the bearing in mm (bore in mm + outside in mm divide by 2) and multiply this by the speed the bearing will operate at. Normal motor type applications operate well below ndm = 500,000. Above ndm = 500,000 indicates high speed. Machine tool spindle bearings can easily operate well over ndm = 1,000,000. When running new open grease packed bearings in high speed situations for the first time, it is necessary to do a running-in procedure in order to avoid damaging them. Probably the number one reason for hot running of newly installed bearings is too much grease in the bearings. It can take a long time for excess grease to push out of the bearings. The whole concept of running-in is to prevent newly greased bearings from over-heating during start-up. All the excess grease in the bearing is churning and it will take some time for the excess grease to work itself away from the contact zone in the bearing and be forced away from the raceways. Properly run-in bearings work with minimal grease left on the cage, giving the lowest frictional moment and lowest temperatures. It is done by closely monitoring the bearing temperature and to shut it down and start it up several times after the bearing cooled down. It is not normally not necessary in "slow" speed application like electric motors, but it is very common in high speed bearings like found in machine tools. Shapers are normally up there in the high speed range and this procedure will be of interest to those looking at replacing the bearings on a shaper or other high speed arn. Running-in normally does not apply to sealed bearings, because sealed bearings already have a small amount of grease in. Most industrial equipment was designed for a bearing life designated B-10. This equates to an average 100,000 hours of operation before 10% of the bearings fail under a given load. If bearings are too lightly loaded however, the balls will skid and cause premature failure. A pump in a paper mill will likely run 24/7 and get a maintenance shutdown twice a year. In terms of operating hours that's a far cry from what a woodworking machine will run even in a production job shop. Getting the shaft to run true in a fairly well balanced condition trumps bearing selection most of the time, at least in the world below 7 or 8 grand. Regarding grease type, the originally specified (good luck finding that info…!) grease in the bearing will be good up to the speed rating of the bearing. Standard factory filled greases are something like Exxon Polyrex EM or a type of Shell Alvania. If you get close to or above the speed rating of the bearing, then a special high speed grease is needed. Synthetic greases are great, because they can handle high temperatures much better and have longer grease lives. Other things being equal, open bearings in oil can run at higher design speeds (rpms). The same bearing in grease has a lower RPM rating. Which grease you use can make a difference. The open bearing has nothing to stop the flow of lubricant in and out of the bearing, thus no heat producing friction from a seal. Grease life calculation models can only calculate life up to 30,000 hours. In slow speed, low temperature applications, their life can very easily be 30,000 hours. However, high speed bearing life at higher temperatures will be much less. In some cases where bearings have to run at or above their rating, then the grease life will be very short, i.e. less than 100 hours. In such cases, open bearings with grease or oil lubrication is obviously needed as sealed bearings would not be practical. Grease life must not be confused with L10 or B10 bearing life. That is determined by the loads the bearing has to support and is an entirely different subject. Drain the solvent and wash the bearing(s) in a second or third container of clean solvent until the bearings are completely clean. When the bearings are clean, they should immediately be protected against corrosion, and the solvent should be removed as it will break down any new grease packed in the bearing. The clean bearings can be dried by using compressed air, but be *very* careful to hold both rings tight. Blow air into the bearing while holding both rings static. If the bearing is allowed to spin during drying, then the bearing can easily reach extreme speeds and with no oil in the bearing, the races will be damaged very quickly. Also make sure clean, dry air is used. Another method is to shake most of the solvent from the bearings and then spin it by hand in light oil. The oil will remove the solvent. Wipe off the excess oil from the bearing surfaces, but make sure a thin coat stays for corrosion protection. Do not give in to the temptation to use way oil or motor oil in bearings. Way oil is intended for for lathe ways and other sliding machine parts especially on metal working machines. As such it has different properties that make it unsuitable for use in bearings sticky, evaporates slowly, not easily washed away by cutting oil, resists drying, low resistance to heat. etc. Motor oil contains detergents to clear and engine of the products of combustion. Not necessary or desirable in an OWWM. Bearing noise equals trouble. That's quite true. The trick is to know the difference between bearing noise and noise made from, say, a loose pulley. There are other noises like an out of balance pulley or a worn pulley where the belt is beating on the bottom of the groove. There can be rumble if the bearing housing is worn or the shaft is worn. New bearings in a worn housing or on a worn shaft will still make noise. Bad lube in bearings will cause a whine, sort of like a Bob Dylan/Willie Nelson duet as the motor slows to a stop. Bad lube means that the oil has gone and the balls are rolling dry. Soon they will heat up and seize. Short runs of a few minutes at a time will only prolong the inevitable activity of bearing change. A nice and easy way to "listen" to bearing noise, is to use a long screw driver or something similar and press it firmly against the bearing housing and then put your ear on the other side. Sounds from the bearing are then nicely transferred directly to your ear. So if you can safely get a screw driver to the bearing housing while the machine is running down, try that. You should be able to hear if there is a grinding or whining sound from the bearings that sounds abnormal. It could be hard to determine if the noise is from the bearing or from something else, but this way you can at least get an idea by "listening" close to the bearing. If you cannot get a source for ready cut washers, then you can use a strip of felt and fold it around the shaft. SKF sells strips of felt in different sections and lengths, but unfortunately not in ready cut washers. It is standard practice in the bearing industry to use strips of felt and then mount it in the sealing groove by folding it around the seal groove and then cutting it to the correct length so that the two ends fit snug together when the seal is pressed nicely into the seal groove. Make sure the felt is well soaked in oil before you install it. It is simple to make felt cutters from pipe or tubing. Chuck in a metal lathe and put a sharp edge on one end of a 3 to 4" section of pipe. Put some oak under your material on the arbor press and you're ready to cut. Or use a vise. Standard machine practice is a slip fit into the bearing housing, (.001 oversize bore perhaps) and a press fit on the shaft, (.0002 over sized shaft or so). If it is loose on the shaft it can, (and probably already has), spin on the shaft and thereby chewing it up. The quick and dirty way is to center punch the bearing seat part of the shaft in four places 90 degrees apart with two or three pricks each. After 'staking it, the bearing is pressed on with some bearing retainer compound. A better way is to have the shaft knurled and turned to size, kind of a more accurate way of the first method. The very best way is to have the shaft spray welded and turned to size. Do not depend on bearing retainers that clamp the bearing by the races to secure it to the shaft. Bearings rated under the ABEC system are typically called "precision bearings", and they are rated with a number from 1 to 9, with the higher number assigned to bearings manufactured against a higher standard of precision (high number = tighter tolerances = more expensive bearing). Higher grade ABEC numbers mean the dimensional accuracy (like manufacturing tolerances of all the dimensions) and running accuracy (roundness of the raceways & balls, etc.) are higher. The higher precision bearings will run much smoother at higher speeds, but the capacity of the bearings are the same and the clearance is the same as normal bearings, unless the clearance is specified as different. An example from another field is that skateboards and in-line skates typically utilize ABEC 3 bearings, better quality products use ABEC 5 or even ABEC 7 bearings. The clearance classes (eg, normal, C2, C3, C4, C5) refer to the unmounted radial internal clearance of the bearing. The values are specified by bodies like ISO and ABMA. Normal, or what is sometimes called CN, is the standard and probably the most common for most bearing sizes. C2 is smaller than Normal. C3 is larger than Normal and C4 is larger is than C3. C5 is the highest and only used in special applications. C3 is very commonly used in electric motor applications. 6204 is a common motor size bearing and this most likely explains why C3 is commonly stocked in this size. Higher clearance than Normal is needed when the operational clearance of the bearing will be reduced a lot. This can be due to strong press fits or high temperatures due to thermal expansion of the steel. C3 is typically used when the speed is high, eg. >75% of the speed rating. High speeds mean more heat and expansion. If all the clearance in the bearings is removed and the bearing sees a heavy preload, then it will burn up very quickly. Normal woodworking applications do not see high temperatures or high press fits. So a general rule of thumb can be used. If the bearing is operating at more than 75% of the speed rating, then C3 clearance bearings will be needed. Otherwise Normal can be used. More detailed explanations of clearance and tolerance are available here. Each bearing manufacturer has their own specifications on shelf life. For SKF sealed/ shielded bearings that are in their original, unbroken packaging, the shelf life is 5 years. After this time, the oil may bleed out of the grease yielding it ineffective for lubricating the bearing. Open bearings that remain in their original, unbroken packages have a shelf life of 8 years. The shelf life of open bearings is based on the corrosion protectant's ability to continue to protect the bearing surfaces. All bearings should be stored in a protected area that is relative vibration and dirt free and not subject to extreme temperatures or excessive humidity. Some rules of thumbs can also be used. Shielded bearing shelf life is in the 5 year range. Service life is in the 8 year range. Sealed bearing shelf life is in the 10 year range. Service life is 12 to 14 year range. If you spring for the latest / greatest sealed bearings the shelf life could be considerably longer, if a synthetic gel grease was used. Ask the supplier to provide shelf life information. All manufacturers have this information available. The fit of the bearing on the shaft is specified by different shaft fit grades like j5, j6, k5, k6, m5, m6, etc. It basically indicates how strong the press fit (interference fit) between the shaft and bearing inner ring is. For a 6204 the typical recommended fit is a k5 fit. Standard tolerance tables exist that show what are the tolerance values for each diameter. When pressing a bearing over a shaft, force should only be applied to the inner race, to avoid damage to the bearings. A couple of good parallels to rest things on when fitting a bearing on a shaft is critical. Bearing plates work as well, but parallels about 5/8"x3"x8" are a good size. Inserting the shaft crooked when pressing a bearing on is a big problem. When starting the pressure, hold things as vertical as possible and start the shaft down in the bearing just slightly. Then release pressure slightly and watch the shaft move slightly as it rights itself. Do another 1/16" or 1/8" increments of pressure, then release. The shaft may go upright a little more as more of the bearing seat fills the bearing's inner race. You're sort of bumping it down a little at a time, releasing pressure completely after each bump to let things settle. Generally, the last half of the distance is a straight push. Heat mounting is a very good way to mount bearings, particularly shielded bearings, if you don't have a press. This process will not work for bearings sealed with rubber or rubber-like materials. Shield bearing have metal covers that enclose the sides of the bearing, and thus have nothing to melt. Heat mounting reduces the risk of bearing or shaft damage during installation, because the bearing can be slid easily onto the shaft. As the bearing cools, it contracts and tightly grips the shaft. It’s important to heat the bearing uniformly, and to regulate heat accurately, since excess heat destroys a bearing’s metallurgical properties, softening the bearing, and can also damage the grease. Never heat a bearing using an open flame, such as a blowtorch. Appropriate electric-heat bearing mounting devices include induction heaters, ovens and hot plates. Of these, induction heaters and ovens are the most convenient, and heaters the fastest, devices to use. Modern bearing induction heaters are a real pleasure to use, because they have a magnetic temperature probe that mounts on the bearing inner ring. You set the temperature and when the bearing reaches the required temperature, it shuts down to prevent over-heating the bearing, and automatically starts again when the bearing cooled down 20 degrees. Toaster ovens, with their radiant elements, may heat the rubber seals or grease faster than the shiny metal parts, but are popular for this application due to their ubiquity and ability to control the temperature. (Turn the fan on in the kitchen as you will get a “slight” warm grease smell coming out of the oven!) Simply setting the bearing on an exposed incandescent light bulb also works well. Due to the curvature of the bulb, most of the heat is directed into the inner race, although it can be difficult to regulate the temperature. Normally a bearing temperature of 150°F above shaft temperature provides sufficient expansion for mounting. Never heat a bearing to a temperature higher than 250°F as this is normally the heat stabilization temperature of the bearing steel. For a sealed and greased bearing, you have to take into account the temperature limit for the grease and seal material. Most multi purpose greases used in sealed bearings can handle up to around 230°F and the general Nitrile rubber seals used on sealed bearings can also handle up to around 230°F, but some type of special seal materials like polyurethane can only handle around 180°F. So 190-200°F is a good safe limit for a sealed or shielded bearing if the sealed bearing has Nitrile rubber seals. For an open bearing, 230°F is a good safe limit. Cooling the shaft is another method to get the temperature differential between shaft and bearing to 150°F. Although this works well and it is many times used with good success, it is not normally recommended by bearing manufacturers as the "heating effect" of the shaft after mounting can cause condensation to form and therefore possible corrosion on the bearing. For ball bearings with shaft diameter less than 2 inches, the interference fit between shaft and inner ring should not be more than 0.001", which means cold mounting with an arbor press or dead blow hammer with a mounting sleeve against the inner ring of the bearing works fine and heating is not normally needed to prevent damage to the shaft seating. It is common to use hot mounting for bearings above 2 inch shaft diameter due to the heavier interference fit used on larger bearings. The 88506 and 6206 are not interchangeable because the 88506 has wider extended inner rings. But, using 6206's gives many more options with seal, clearance and grease options than using 88506’s does. There are several possible methods for replacing 88506’s with 6206’s. One method is to making on a lathe spacer bushings for above and below the bearing. Thus a “sandwich” of spacer|6206|spacer replaces the 88506. 1. Use 6206 with low friction seals. Rubber seals have good sealing, but lower friction than a normal sealed bearing. They can operate up to 12000 rpm compared to 7500 rpm for normal sealed bearings. Most good quality bearing manufacturers have low friction seal options, eg SKF. 2. Use a shielded 6206 and mount a Nilos Ring above the top bearing. A nilos ring is a metal shield you mount outside the bearing. It has a thin sealing lip than rubs against the one bearing. The ones in these pictures rotate with the shaft and seals against the outer ring of the bearing. It is quite an effective seal and it will help a lot to keep dust out of the bearings, but they also have a speed limit. Numerous members have reported quality and durability problems with bearings made in China. Problems encountered include excessive noise, heat, and failure after short use. Many companies make/source some of their bearings in China, even though they are not Chinese companies. 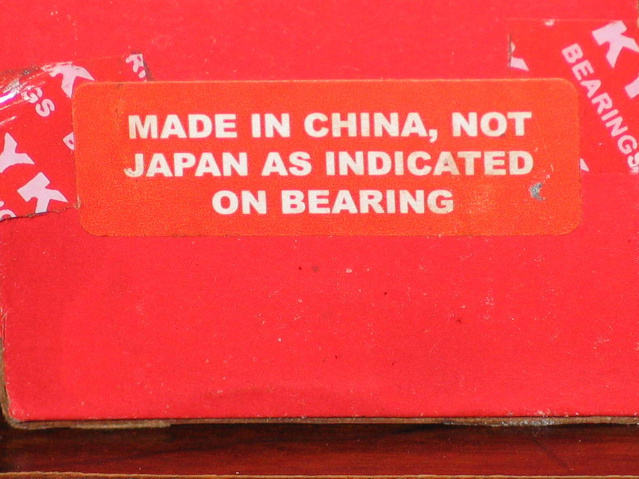 Thus when ordering, specifically requesting bearings from a non-Chinese company may not be sufficient. It is necessary to explicitly request bearings not made in China. This is a reflection of quality processes currently in place in factories in these countries, and the markets/price points these manufacturers are seeking. Get at least a Nachi (Japanese) brand or better and you won't have to worry about what's going to happen in a couple of years. Nachi is a medium quality brand. Fafner, NSK, SKF, are all top of the line bearings. Many folks feel that when they are going to all the trouble of tearing a machine down to rebuild or repair, that a few extra dollars spent on better quality bearings is well worth it. On the other hand, so what if the bearings get a “short” life until failure, maybe they fail at 10,000 hours. How many hours are going to be logged on your machine each week in a one man shop? Even ten hours a week gives a lifespan of 1000 weeks, or nearly 20 years of service. Bottom line is to make sure that the bearings you put in will provide the service life you require/expect. Going with slightly higher quality bearings will rarely yield an unhappy surprise. Going with slightly lower quality bearings will most often yield a fairly quick unhappy surprise. This will help decipher what all the letters and numbers in a bearing code mean. AHR International's extensive library of bearing manufacturers part number systems. The designation suffixes used to identity certain features of SKF deep groove ball bearings are explained in the following.